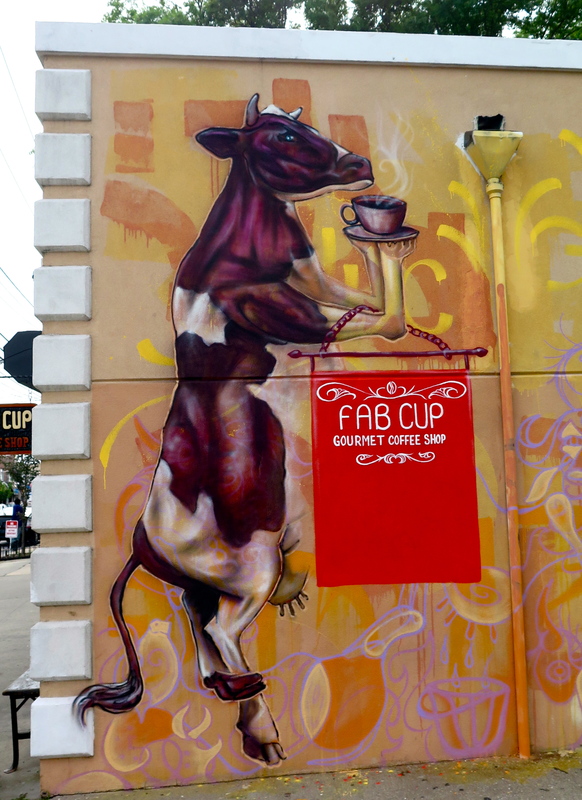 When Maria, the owner of Fab Cup Coffee Shop in Staten Island, commissioned me to paint a mural on the large outdoor wall of her establishment, her only request was that it should feature cows. Maria is from Russia, where the rural Siberian scenery she was immersed in growing up always included cattle, leading to a life-long fascination with these animals that give her nostalgia for her homeland. She and her Cuban-Brooklynite husband, Juan, ended up settling in Staten Island, where they have a new baby and a new business: Fab Cup! All that was missing was some artwork for that big blank wall facing a major commercial corridor. I admit that at first I wondered to myself, what’s so special about cows that will provide me inspiration for an entire mural? But after a little research, I realized that these are truly significant animals to human history and cultures around the world. From the famous holy cows of India to the Mother of the Sun in ancient Egypt- portrayed as a cow- humans have always found inspiration in these creatures. Due to their milk-producing nature and vital role in farming, many peoples consider cows to be symbols of fertility, Mother Earth, and renewal. I found many interesting photos of cattle to use as references, from the milk cows we are accustomed to seeing in rural America to the long-horned (and very hairy) highland cattle of Scotland; and of course I had to include the cow’s male counterpart, the bull, an animal similarly steeped in symbolism. Thanks to Maria, Juan and the whole Fab Cup crew for the warm hospitality (and excellent coffee and sandwiches) during my four days of painting!